In line with the vision and commitment in developing innovative solutions and eco-friendly smart products, UNICOIL introduces the recent development of Mogalvin CTOC – A Hot Dip Galvanized Steel with Colored Thin Organic Coating (CTOC). 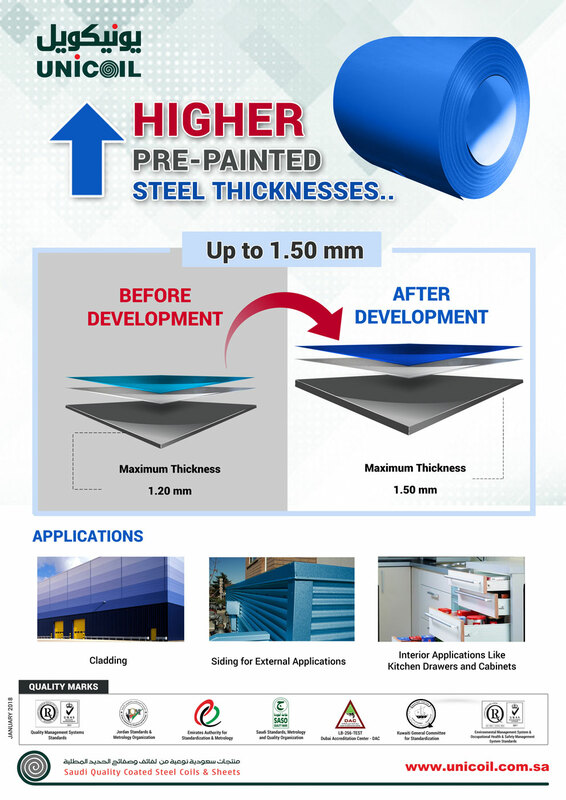 Unicoil recently developed its Pre-Painted Steel products’ thicknesses up-to 1.5mm, the newly developed thickness will serve several end use categories such as cladding, side building claddings as well as some home appliances like kitchen drawers and cabinets. Unicoil Recently Launched Its New Smart Pre-Painted Steel Sheets “Colorite Hi-Build” Coated with Polyurethane Polyamide for Harsh & Highly Aggressive Environments, and that Resists Superior Corrosion, and Suitable for Marine and Industrial Environments, also Recommended for Power Plants and Chemical Plants/Refineries. Unicoil recently developed and launched new Smart Pre-Painted Steel Sheets “Colorite-HDP” with versatile High Durable Polyester System providing excellent flexibility and UV resistance suitable for aggressive environments. UNICOIL introduced Touch-Up Paint as a smart solution for repairing scratches on Pre-Painted Steel products and to provide sustainable satisfaction to end users. Zinc Rich Touch-Up is the best solution for repairing scratches on Galvanized Steel Sheets which may occur during transportation, installation, Fabrication & Forming. The Saudi Standards, Metrology and Quality Authority (SASO) recently published the new revision of Pre-Painted Steel Products. In the new revisions declared Lead amount in paints not to exceed 90mg/kg, Zinc coating mass must not be less than 90gm/m2 and mandatory to print the product’s specifications on each linear meter (Steel Nominal Thickness, Zinc coating mass, Paint Film Thickness (Top + Bottom), SASO Standard number, Manufacturer’s Name and Country of Origin). UNICOIL developed premium pre-painted galvanized steel coils and sheets with higher durability, stain resistance, abrasion resistance and metal marking for for Residential, Agricultural and commercial Construction Industrial segments. UNICOIL developed pre-painted galvanized steel coils and sheets with higher durability steel sheets under frequent abrasion. UNICOIL developed pre-painted galvanized steel coils and sheets with new thickness range starting from 0.22 up to 1.20 mm. Pre-painted galvanized steel coils and sheets in either our standard sizes or custom sizes are available on request. UNICOIL developed galvanized steel coils and sheets with new thickness range starting from 0.20 up to 2.00 mm. Galvanized steel coils and sheets in either our standard sizes or custom sizes are available on request. On the Occasion of International Lead Poisoning Awareness Week (October 23-29), “UNICOIL” Signed a Joint Cooperation Agreement with “SANAD” Children’s Cancer Support Association. As Part of its Social Responsibility – UNICOIL Supports National Social Institutions Towards Safe-Society from Lead Hazards. Enhances Air Quality of Central Air-Conditioning Ducts and Provides Higher Protection of Health and to the Environment. UNICOIL Launches its New (Shinko – Jidar) PPGI Steel Sheets Reflecting Natural Walling Look for Partitions, Industrial Buildings, Fencing & Partitions. With (8) Quality Marks & Accreditation for its Products of Galvanized & Pre-Painted Steel Coils & Sheets, UNICOIL Achieved A Unique Status of Excellence in The National & Regional Steel Industry. UNICOIL Laboratories received the Laboratory accreditation, conforming to ISO17025-2005, from Dubai Accreditation center (DAC) a signatory of ILAC – MRA (International Laboratories Accreditation Cooperation- Mutual Recognition Agreement), yet another FIRST achievement added to its impressive list of Accreditations. UNICOIL is the first and only company that received such an accreditation in the flat steel industry within Middle East. UNICOIL’s R&D team, along with its technical partnership from Beckers, successfully developed Chromium-free Pre-painted Galvanized steel which is an extra eco-friendly product, produced by applying a chemical conversion coating layer and a primer coating layer, both chromium-free, on the surface of the hot-dip zinc coated steel substrate, and then applying a topcoat. Since the topcoat does not contain any chromium even in conventional pre-painted galvanized steel, this new product is completely chromium-free and complies with ROHS regulations. (ROHS: Restriction of Hazardous Substances directive). UNICOIL was successful in line trials of galvanized steel production using passivation treatment with Trivalent Chrome. This process provides extra eco-friendly and safer products for human with similar white rust and corrosion resistance properties, at a cost slightly higher than the cost of treatment with Hexavalent Chrome. With (7) Quality Marks & Accreditation for its Products of Galvanized & Pre-Painted Steel Coils & Sheets, UNICOIL Achieved A Unique Status of Excellence in The National & Regional Steel Industry. Universal Metal Coating Company Ltd (UNICOIL), headquartered in Jubail Industrial City, received the Kuwaiti Quality Mark in yet another first achievement added to its impressive list of accreditations, including SASO’s Saudi quality mark, ESMA’s Emirates Quality Mark, JSMO’s Jordan Quality Mark and the ISO Quality Certificate, for UNICOIL’s galvanized and pre-painted steel products. Colorite AB (Anti Bacterial) – Prepainted steel is developed to provide Microbial protection for interior and exterior applications with good weatherability & good formability. The anti microbial agent in the paint is designed to inhibit the growth of odor causing bacterial and prevent product deterioration of the product from mold and mildew. Molawan Thermo-Cool is a Pre-Painted Galvanized steel Coated with Thermal reflective Paint, consisting of Special ceramic pigments, is designed to lower the surface temperature of building when used for roofing/ walling applications to provide Thermal comfort and Energy Savings. UNICOIL offers an innovative service to our valued customers and end users. Six standard colors for the Molawan products can be supplied within a short delivery lead time with a very low minimum quantity. UNICOIL is the only company that can rapidly supply its customers such a wide range of steel colors combined with flexible order quantities. UNICOIL developed galvanized steel sheets with thicknesses up to 2.00 mm. Galvanized steel coils and sheets in either our standard sizes or custom sizes are available on request. UNICOIL has been accredited with the JQM for galvanized and prepainted steel products by the Jordan Standards and Metrology Organization. In addition, UNICOIL recommends the following independent and accredited laboratories in Saudi Arabia if an independent laboratory test statement is required. UNICOIL offers free laboratory testing services! The constituent components of galvanized and prepainted steel sheets cannot be identified by the naked eye. Moreover, the amounts of the various components in most imported steel sheets do not match the declared amounts. UNICOIL has been accredited with ISO 14001 (Environmental Management System Standards) and OHSAS 18001 (Occupational Health & Safety Management System Standards) under the terms set out under UKAS (United Kingdom Accreditation Service). UNICOIL launched a newly developed prepainted steel product with a cloud-white color on both sides, in thicknesses of 0.32 mm, 0.35 mm, 0.40 mm, 0.50 mm, 0.60 mm, and 0.7 mm. UNICOIL now has the capability to supply steel sheets with uniform double-face colors other than standard (cloud white) upon request. UNICOIL started to update its invoices into Arabic languages in compliance with the industrial and commercial controls as stipulated by the Saudi Ministry of Commerce and Industry. UNICOIL is committed to ensuring the quality of its products and to protecting the environment by meeting the safe lead limit (90 mg/kg) and by using zinc of the highest possible purity. This is in keeping with its pledge to produce safe products in order to contribute to a healthier world and a cleaner environment. UNICOIL launched its “Know Your Galvanized Steel Sheets” social responsibility campaign for galvanized steel products. UNICOIL’s prepainted galvanized steel coil and sheet products have been accredited with the ESMA by the Emirates Authority for Standardization & Metrology. UNICOIL’s galvanized steel and prepainted steel products have been accredited with the SASO by the Saudi Standards, Metrology and Quality Organization.